You know when you go to parties and you either take your own food, eat before you go or speak to the host to check which foods might be suitable for you? Well the one thing I have always known were OK and that are easy to spot at a party were the vegetable crisps. These are always safe right? Despite knowing they are always safe I still check the ingredients because you never know. There a few brands including Tyrells and Kettle Chips and some own brand varieties. I have checked the labels religiously over the years and they have remained freefrom allergens. 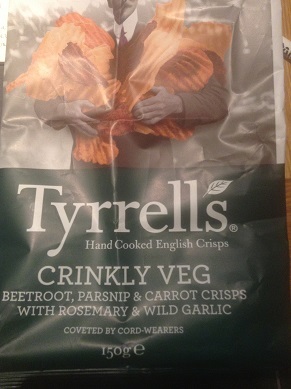 They are always ‘just’ vegetable crisps. Right? This Christmas my Mum bought some vegetable crisps, a stock food item at parties as everyone knows I can eat them and the kids love them too. There were two bags of vegetable crisps on the table. It turned out there was normal variety which was OK and one which was most definitely not OK.
Watch out for Tyrells Beetroot, parsnip & carrot crisps with rosemary and garlic. Mixed Root Vegetables In Variable Proportions (Parsnip, Carrot, Beetroot), Sunflower Oil, Rice Flour, Yeast Extract Powder, Herbs (Including Rosemary), Salt, Garlic Powder, Yeast Powder, Cheese Powder, Onion Powder, Sugar, Natural Flavourings, Cotswold Wild Garlic Leaf. Contains Milk. Nb: One thing to note also is that crisps can be very dangerous. Consider what has been in the bowl before? Have the crisps been put into a bowl that previously contained salted peanuts? Generally the rule is, don’t eat crisps unless you’ve seen the packet and are 100% certain they are OK for you. They also all look confusingly alike once they are out of their bag so be very careful where crisps are concerned. Why do flavoured crisps have to contain dairy? Why oh why do so many crisps contain milk or cheese powder? I am quite happy with ready salted crisps and actually do enjoy them but there are hardly any flavoured crisps that don’t contain some dairy, whey powder of milk powder of some sort. My plea to Tyrells is to try to make these without the cheese powder though I don’t expect them to. But also to list the herbs too. Some people can’t eat certain herbs and it’s just so helpful to know which ones have been used. Labelling is a minefield and on this particular packet the ingredients were listed in ten languagues which is great, but means the type face is so small, probably about point 4 size in word. I can read them but anyone with poor eyesight would need glasses and/or a magnifying glass. And so the moral of the story is, always check the ingredients, even on those products that you know and love. Recipes can change, new flavours can be launched, as in this case with the different flavour vegetable crisps, and ingredients like cheese powder can appear in a product you least expected to contain it.